New Bridge Integrated College has won a place in the senior final of this year’s BBC Radio Ulster School Choir Of The Year. 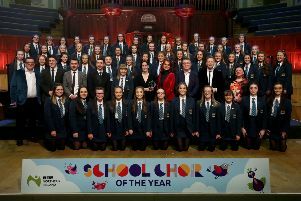 Over the course of the past seven weeks, primary and secondary school choirs from across Northern Ireland have been singing to impress as they battle it out for a place in the final of the BBC Radio Ulster School Choir Of The Year. The series, part of BBC Music NI, will culminate in a live final from the Ulster Hall, Belfast, on Sunday April 17. It was Carrickfergus Grammar, Dalriada Ballymoney and New Bridge Integrated College Banbridge who most impressed the judging panel, made up of Richard Yarr, Senior Producer Classical Music, BBC Radio Ulster; Ciaran Scullion, Head of Music with the Arts Council of Northern Ireland, and Rebekah Coffey, soprano and coach with the Ulster Youth Choir.